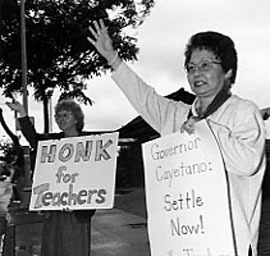 Hawaii educators picket in 2001. Photo Courtesy of the Hawaii State Teachers Association. Striking is a way for workers to pressure their employers to meet their demands. If union members vote to strike, production is shut down. During the strike period management and labor continue to negotiate. When union leaders think they have an acceptable contract proposal from management, all the union members must vote whether or not to accept the proposal. If the new contract is accepted, the strike ends. If it is rejected, the strike continues and negotiators for both sides must work out a new proposal. Strikers often carry signs stating their demands or complaints while walking in an organized manner in front of their workplace. This is known as picketing. The entire Hawaii public school system was shut down by a strike of public school teachers and university faculty in 2001, the first time this had ever happened in the United States.